This is something maybe secondary when comparing with MABs, but since the change in theme in 3.6 and 4.0, the border of docked panels looks inconsistent with the rest of the borders. For example, in figs I'm attaching, there a white line over the upper border of the docked panel, which remains from the previous look of rulers and toolbars. I'm ataching 3 images. The first one is how a docked panel looked in 3.5. The second one is how it looks on 4.0. The 3rd one is a possible solution. Docked on the right side. I dont usually use Windows, but it seems to be that there is an inconsistent border at the bottom in this specific theme, which I didnt see under Kubuntu. * In the same manner, a line would be drawn above the toolbars docked at the bottom if there are any. * A line would also be drawn to the left/right of toolbars docked at the sides if there are any. This line would stretch from the aforementioned top line to the bottom line. * A line would be drawn below each panel docked at the top, above each panel docked at the bottom, to the right of each panel docked on the left, and to the left of each panel docked on the right. * If two panels docked at the side share the same column (one is above the other), a line should be drawn between them. Hopefully I'm not missing any scenarios. As for the line, it should be 1 px thick. It would be excellent if we could get its color from the theme, just like we are doing with the current borders. If that's impossible, I'd suggest to use the same color we use for the line separating the status bar. Mirek, I think it looks 0K :) . May I ask you a mockup with Oxygen theme (if you have the time)? > you have the time)? Ahmad H. Al Harthi committed a patch related to this issue. 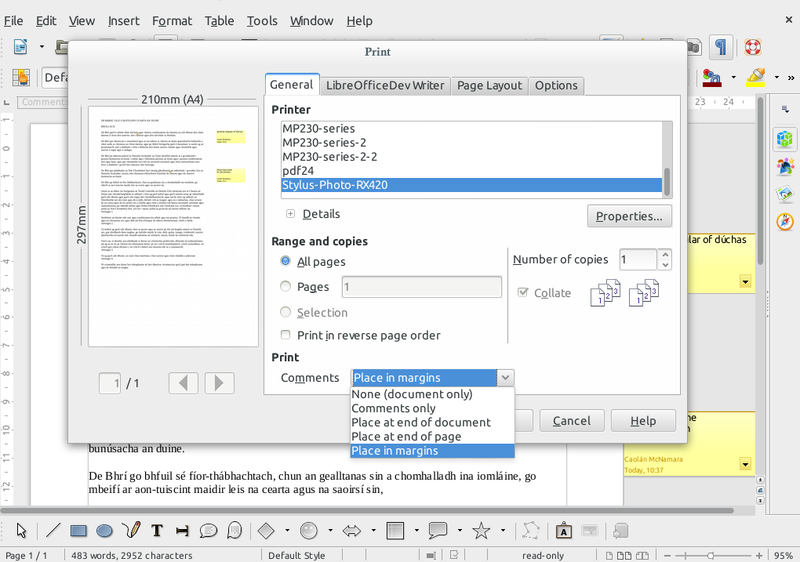 It will be available in LibreOffice 4.1.6. @Ahmad: did you commit the “different patch for 4.3” that you mentioned? 3D borders can still be seen on 4.3, see https://wiki.documentfoundation.org/images/3/3d/In-margins-option.png for an example. Not yet, the patch for 4.3 doesn't look good on Windows. I don't have time for it now, but I'll try to fix it ASAP. If the bug is still present, why is it marked as "RESOLVED/FIXED"? Feel free to reopen and provide exact info what is not yet fixed and still needs to be done. Thanks. > what is not yet fixed and still needs to be done. Thanks. > > what is not yet fixed and still needs to be done. Thanks. Sorry, dock borders doesn't look exactly like in 2nd attachment, but 3D borders are still present and 2 borders are at the bottom of docks. > > > what is not yet fixed and still needs to be done. Thanks. > borders are still present and 2 borders are at the bottom of docks. They don't need to -- the white highlight is perfectly acceptable, possibly even nicer. My proposal was just based on assumed ease of the implementation. The problem with the implementation, though, is that the toolbar area isn't delineated -- e.g. above the ruler or to the left of the sidebar in your screenshot. > even nicer. My proposal was just based on assumed ease of the implementation. Personally, I prefer the look without the white line, I think is more consistent with the rest but that's only my opinion. But in any case, my previous comment (18) was only because of comment #16 and comment #17. Is the problem of the separator line is related to bug 57433? This bug is old & there were various changes over the place in the meantime. Please let's close it, and if you are still unhappy with some aspects, please file new, separate issues. Please note that the look is different in OS X, Windows, and on Linux, and that mostly we try to mimic the look of the 'native' applications on those platforms.